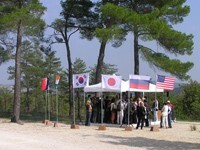 Visitors at the ITER stand, which was placed at the exact future location of the ITER tokamak. Under clear blue skies some 350 CEA Cadarache staff, their families and friends were welcomed to the ITER site during the 2006 "Journee Portes Ouvertes" on Sunday 15 October. Agence ITER France and ITER Organisation staff were on hand to take them by bus from the Tore Supra building to the ITER site, where Akko Maas and Olivier Guérin gave them a brief talk and answered questions on the project. There was particular interest in the movement of the large components by the "millepede" transporters. Lots of brochures were taken away to read at home by children and adults alike. In total, more than 3500 visitors were received on the CEA site.